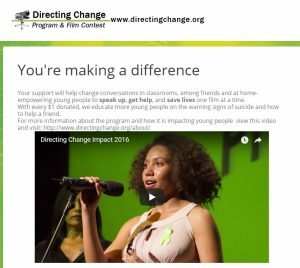 Donate to the Directing Change Program and Film Contest. Your support will help change conversations in classrooms, among friends and at home- empowering young people to speak up, get help, and save lives one film at a time. With every $1 donated, we educate more young people on the warning signs of suicide and how to help a friend.